Tony Cox is a Full Professor and Associate Chair of Journalism in the department of Television, Film and Media Studies at California State University, Los Angeles. He is a veteran, award-winning radio and television journalist in Los Angeles with more than four decades of experience covering local, national and international stories. His radio career posts have included serving in the host chair of NPR’s “Talk of the Nation,” “Tell Me More,” “News and Notes,” “News and Notes with Tony Cox”. “The Michael Eric Dyson Show” and the “Tavis Smiley Show” from 2003-2012. He also served as interim host of “Marketplace Money” for Minnesota Public Radio. In addition to those hosting duties, Cox had his own nationally syndicated radio talk show “Upfront with Tony Cox,” from 2009-2010, sponsored by the African American Public Radio Consortium. As an interviewer, Cox tackled a mix of news, entertainment, talk, opinions, sports and more with celebrities, politicians, artists, athletes, newsmakers and just plain folks with something to say. His love of sports landed him a job at FOX Sports Net’s “The Last Word With Jim Rome” in 1998 and DirecTV Sports as a correspondent. Cox has also been a featured contributor on TV One’s “The Gospel of Music with Jeff Majors,” and he has done voiceover work for the Tiger Woods Foundation, among others. For more than a decade he hosted the TV program “Choices” for the Los Angeles Unified School District. 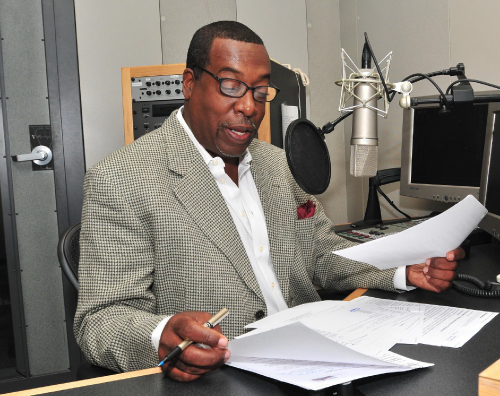 His excellence as a broadcast journalist has been recognized with a prestigious Los Angeles Area Emmy Award, and multiple nominations; five Golden Mike Awards; seven Los Angeles Press Club Awards, two NAACP Image Awards, and a Los Angeles Urban League Award. His commitment to civic and community involvement resulted in several citations, including 30 year service as host of the Los Angeles County Department of Children and Family Services annual “Black Adoption Day” celebration. Cox has also been honored by Cal State LA campus organizations for his volunteer involvement in several projects, including faculty advisor for Golden Eagle Radio and the Student Sports Production Unit. Cox is a founding member and first president of the Black Journalists Association of Southern California (BJASC) for which he was honored as a Pioneer Black L.A. Journalist by the Los Angeles City Council in 2018. He also served as Vice President of Broadcast for the National Association of Black Journalists (NABJ). A Los Angeles native, Cox holds a Bachelor of Arts degree in English and a Master of Fine Arts degree in Theatre from UCLA. He is married with 3 children.